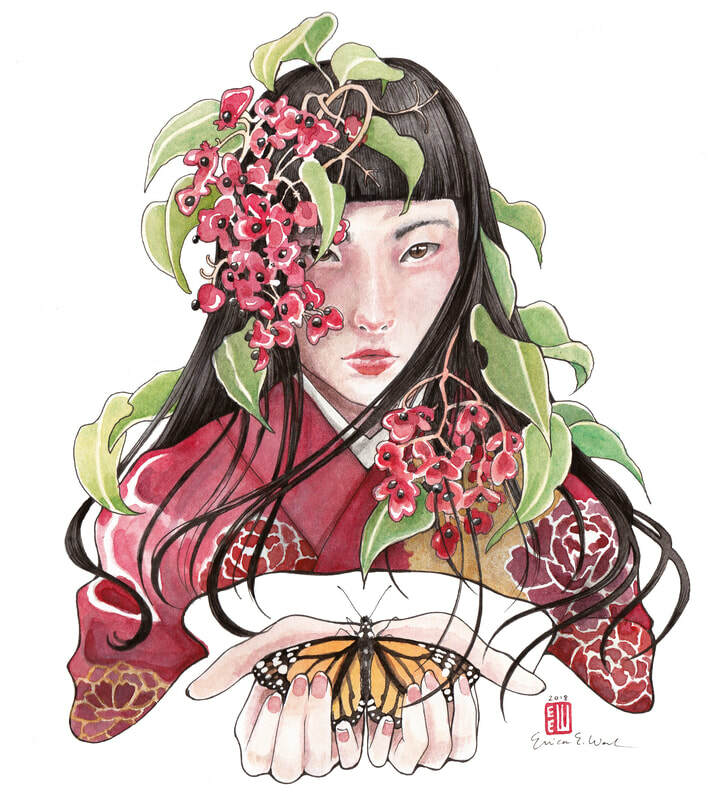 For her 2019 Solo Exhibition, Erica Ward will be displaying a color-themed series of figure illustrations. All works are new and presented for the first time at this exhibition, "Rosenzu-iro" Please join us on 6/15 for the free public opening reception. This winter Erica Ward will be displaying a series of watercolor paintings in her home town of Santa Cruz, Califorina. The artworks will be on display and for sale at Coffeetopia Coffee Shop on Mission Street from December 20th through all of January, 2019. Works are for sale off-the-wall so plan to come by earlier rather than later to see the full series. 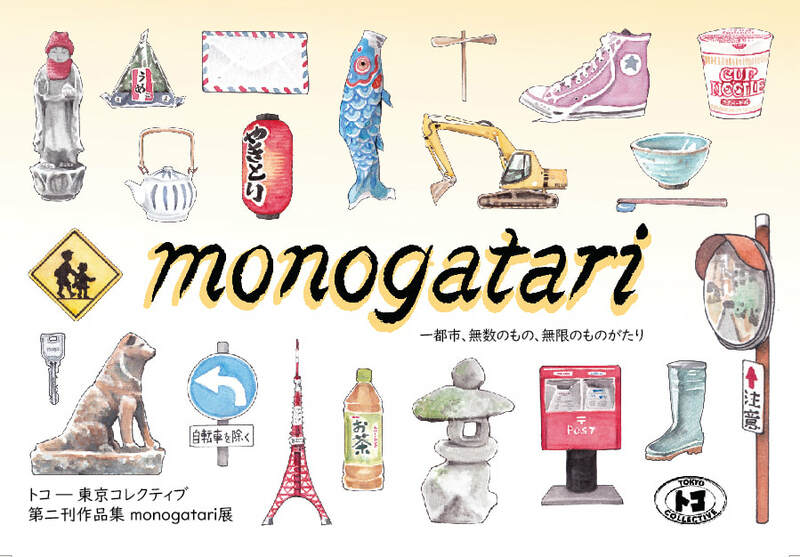 Anthology zine, "monogatari," had an amazing turnout for its release party and art exhibition. Drago Flores created a beautiful video capturing the essence of the event and helping us tell about the zine and ToCo, Tokyo Collective. 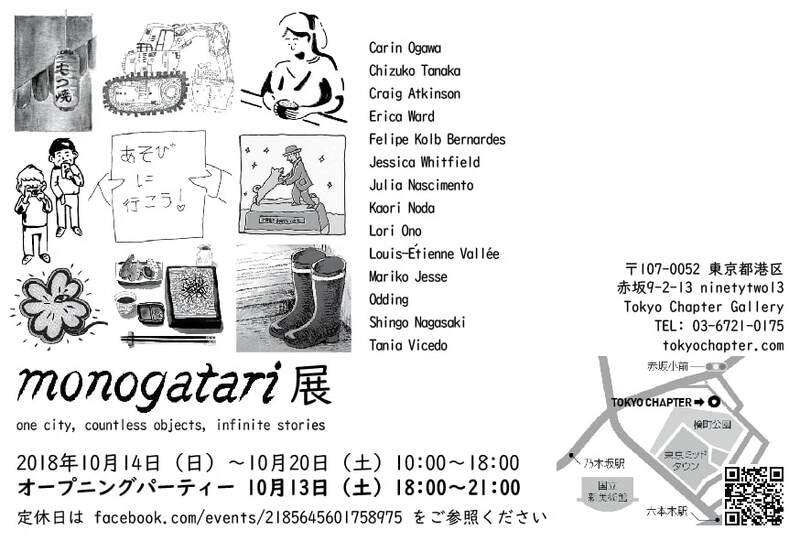 Come celebrate the release of ToCo- Tokyo Collective's second anthology zine, "monogatari" on Saturday evening, 10/13! 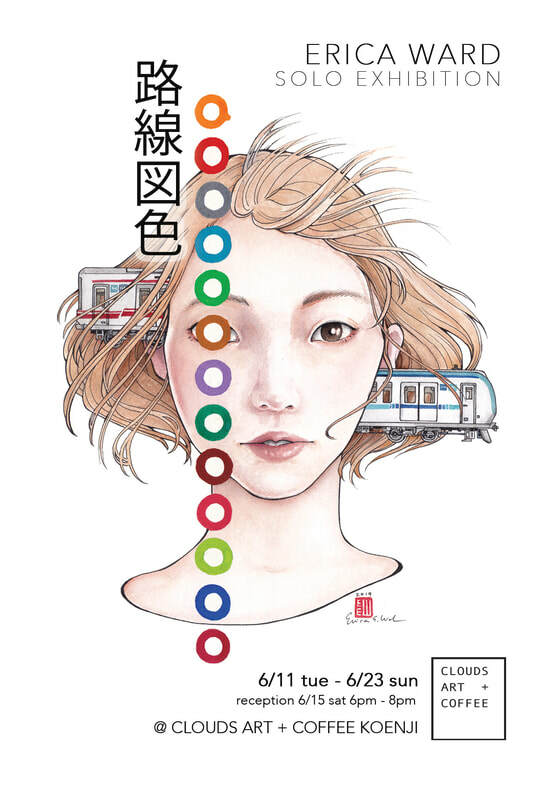 "monogatari" is a zine collection of comics and illustrations that creatively tell the stories of objects ("mono") in Tokyo. Enjoy the original artwork of our 14 participating artists along with refreshments in the awesome gallery space provided and sponsored by collaborative workspace and living space community: Tokyo Chapter. ​I recently was interviewed by ADC news about my current exhibition, "Cats in Portrait." My painting, "Tori," is on display as part of the "Junten" exhibition this week at the Tokyo Metropolitan Art Museum. The "Junten" exhibition featuring artists from Tokyo and all over Japan will be on display from Monday 9/10 through Monday (Holiday) 9/17 in exhibition halls 3 and 4. Hours are from 9:30 to 17:30 (last enterance allowed at 17:00 and enterance ends at 13:00 with a closing time of 15:00 on the final day.) Enterance fee is 500 yen. 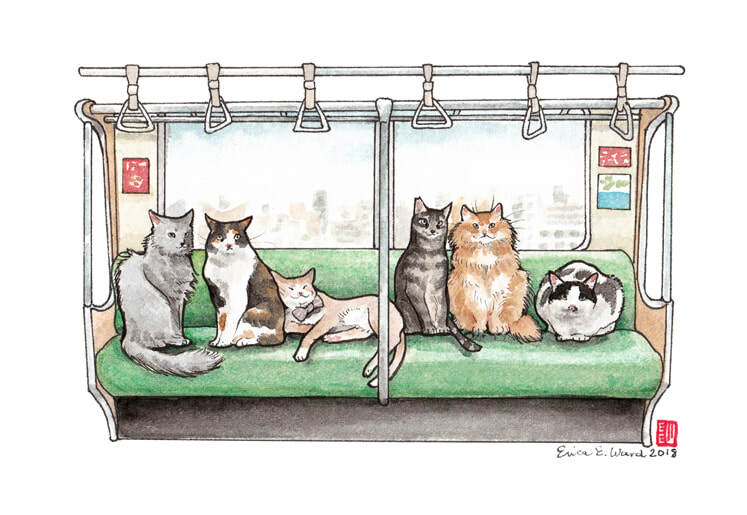 View Erica Ward Illustration’s new series, “Cats in Portrait,” while also supporting shelter cats! Necorepublic is a rescue cat cafe—utilizing the popular “cat cafe” to fund the rescue, and facilitate the acclimation and adoption of homeless and abandoned cats. Necorepublic is 100% no-kill shelter that helps connect cats with loving homes, and also cat-lovers who can’t own with a place to play and cuddle with furry friends. Necorepublic’s mission includes fighting to make Japan a no-kill country for cats by 2022. If you or anyone you know is interested in visiting a cat cafe, please recommend this cruelty-free option. Erica Ward has been volunteering at Necorepublic Tokyo, Ochanomizu Branch for the last two years, and has happily accepted the chance to present a solo exhibition with the cat visiting rooms. Come meet the cats and enjoy portraits of the current residents and also recents “graduates.” 50% of art sales will be donated to Necorepublic and go towards continuing to save the cats. * 4-Friends Course: If you come as a group of four and enter for the 60-minute plan, one group member’s entry is free! * Introductionn Course: If a Necorepublic passport holder comes with a friend visiting for the first time, both friends get a discounted entry! ** Live cats are present! Please take precautions if you are allergic, etc. ** The cats are so cute, you may feel strong urge to adopt! 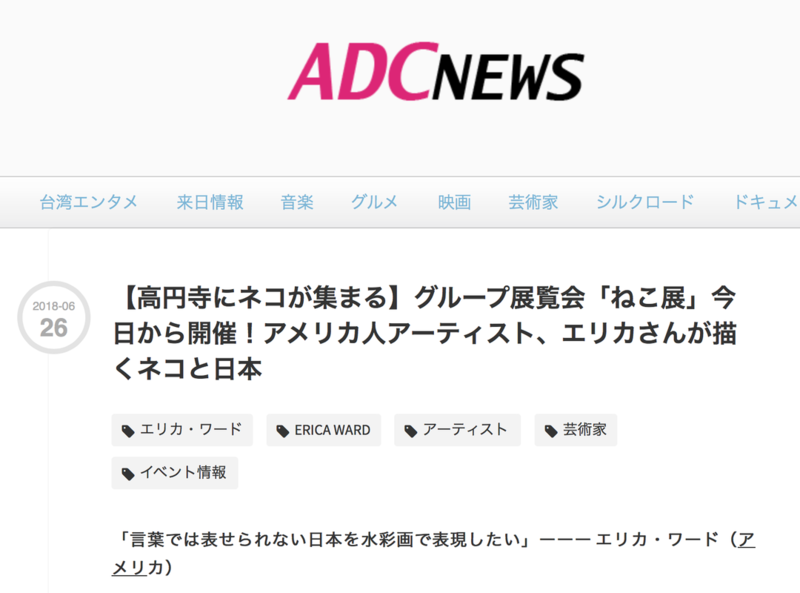 ADC's article about my participation in CLOUDS ART + COFFEE's Nekoten Cat Exhibition. 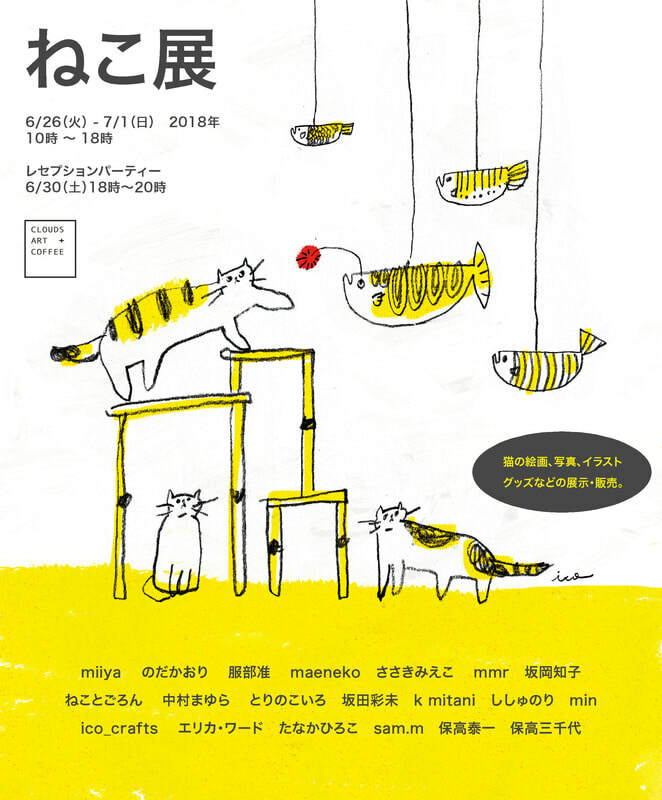 20 artists including Erica Ward Illustration will be displaying and selling their cat-themed artworks and merchandise at Clouds Art + Coffee in Koenji from Tuesday 6/26 till Sunday, 7/1. Erica Ward will be showing new feline-featured watercolor and ink works, but there will be a fantastic variety of styles and cats. Check out the Facebook Event Page too!